Back in December, we put together a Merchandise Guide for the Assassin's Creed Movie. We here at The Ones Who Came Before love Assassin's Creed Merchandise, so we're putting together another guide to log all the items we find for Assassin's Creed: Origins! Let us know if you find it useful at all. We'll be updating the Merchandise Guide as more items are revealed. We've already put together a page to help fans decide on which edition of AC: Origins to purchase, find it here! ​The Art of Assassin's Creed: Origins. Discover Assassin's Creed Origins Desert Oath, written by Olivier Bowden, author of previous Assassin's Creed novels. The novel takes places before the events of the game and portrays a young Bayek following his father's footsteps, leaving the peace of his hometown in search of answers. A journey will take him along the Nile and across a country in turmoil as he faces the dangers and mysteries of the Medjay's path. Bayek Protector of Egypt Figurine by UbiCollectibles. ​Ubicollectibles is proud to be part of the grand return of the Assassin’s Creed game franchise, with its new figurine directly inspired by Assassin’s Creed® Origins’ main character: Bayek. Discover Bayek with his complete outfit including a shield, a bow and the iconic hidden blade. The figurine shows Bayek and his eagle Senu targeting their next prey. ​Ubicollectibles is proud to be part of the grand return of the Assassin’s Creed® game franchise with its latest figurine directly inspired by Assassin’s Creed® Origins. Discover Aya, a brilliant woman with a mind as sharp as the weapons she handles. The figurine shows the Egyptian fighter with her own fighting style equipped with dual wielding blade. ​Ubicollectibles proudly presents one of the most mysterious artefact of the assassin’s creed game franchise: the Apple of Eden. Discover the official reproduction of the relic that will be seen in Assassin’s creed origins. Thanks to its led system, the life size replica will illuminate from within with the press of a button and will be displayed on its fine Egyptian-style base. Ubicollectibles proudly presents the life-size replica of the first Hidden Blade ever in the history of the Brotherhood of Assassins, directly inspired by the game Assassin’s Creed® Origins. Equip yourself with the first Hidden Blade and feel like Bayek by wearing the same secret weapon or display it as a collector piece. This limited item is a great addition to any Assassin’s Creed fan collection. Go back to where it all began for the Assassin’s Brotherhood with a new T-shirt inspired by Assassin’s Creed Origins, complete with the Assassin’s Creed logo and replica of Bayek’s shield. The t-shirt will be available for purchase at E3 in the Ubi Workshop Booth and online at various locations. ​Available as a pre-order bonus or individual sale at Hungarian Retailer GamersRoom. ​Mexican Retailer Mixup are offering an #AssassinsCreedOrigins T-shirt as a pre-order bonus! Spanish Retailer Media Markt have revealed an exclusive #AssassinsCreedOrigins T-shirt, available as a Pre-Order Bonus. Assassin's Creed Origins: Anubis T-shirt. 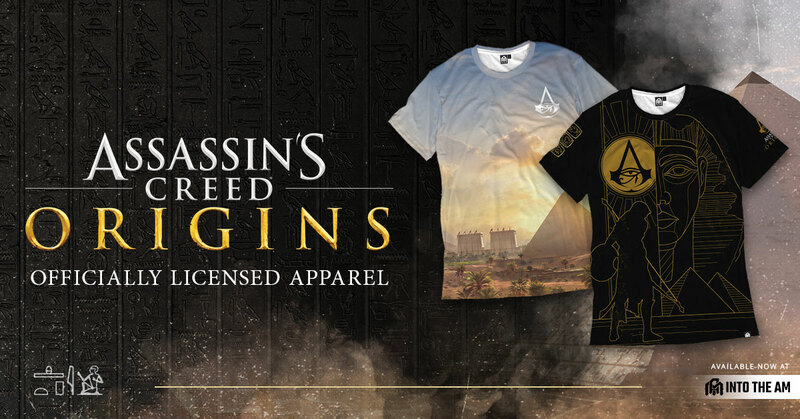 ​Exclusive Assassin's Creed Origins T-shirts will be available at Gamescom 2017! Assassin's Creed - 10 Year Anniversary Men's T-Shirt. ssassin's Creed Origins - Vintage Bayek Women's T-shirt by Bioworld. "A sophisticated look for a sophisticated Assassin! The Assassin's Creed Origins - Bayek Dress Shirt is designed for comfort and style for both formal and informal environments. Showcasing a unique hieroglyphic pattern, the Assassin's Creed Origins - Bayek Dress Shirt was designed with subtlety yet without compromising the signature Assassin’s Creed style. Guaranteed to make heads turn in any social setting!" Go back to where it all began for the Assassin’s Brotherhood with a new Hoodie inspired by Assassin’s Creed Origins, complete with the Assassin’s Creed logo and replica of Bayek’s shield. Several Slovakian Retailer's are offering this Hoodie as a Pre-order bonus. Assassin's Creed Origins Hoodie, featured in this Month's Loot Wear Crate. Assassin's Creed Origins - Bayek's Tattoo Hooded Woman's Sweater. Discover the origins of the brotherhood with the Assassin's Creed Origins - Aya Tunic. With the signature hooded cowl and hidden blade print right on the sleeve, this long sleeve shirt will let you explore the mysteries of ancient Egypt or the streets of your own hometown! Sometimes subtlety is the best weapon of an assassin. With the Assassin's Creed Origins - Medjay Sweater, we offer a different style in our Assassin’s Creed Origins lineup. With a unique hieroglyphic interior lining, this hoodie is design for comfort and versatility in any setting. Discover the origins of the brotherhood with the Assassin's Creed Origins - Bayek hoodie. Custom designed to replicate Bayek’s signature look, the Assassin's Creed Origins - Bayek hoodie is perfect for roaming ancient Egypt or showing your allegiance to the brotherhood right in your own hometown. Designed and stitched with only the highest quality materials, you do not need to be a master assassin to enjoy this garb! Be prepared for any adventure with the Assassin's Creed Origins - Canvas backpack! An ideal combo for maximum comfort and practicality! Assassin's Creed Origins door poster. ​Brazilian Retailer Tilibra have listed a number of #AssassinsCreedOrigins Notebook designs. Several Slovakian Retailer's are offering this Scarf as a Pre-order bonus. ​Assassin's Creed Origins Cap by Bioworld. Assassin's Creed Origins Canvas Snapback by Bioworld. ​A truly unique piece for a truly unique Assassin! Our Assassin's Creed Origins - Bayek Scarf was designed with a scarf in mind but with an Assassin’s Creed twist! Engineered for outerwear on cooler days, this scarf sports our Assassin’s Creed signature hood adding an extra layer of comfort, style and protection against the elements! A great complement to your outerwear collection! ​Pre-Order Assassin's Creed: Origins at GameStop and receive a Collectable Bayek Pin. ​Game Informer Issue for July 2017. Will most likely be sold on the UbiStore at a later date. 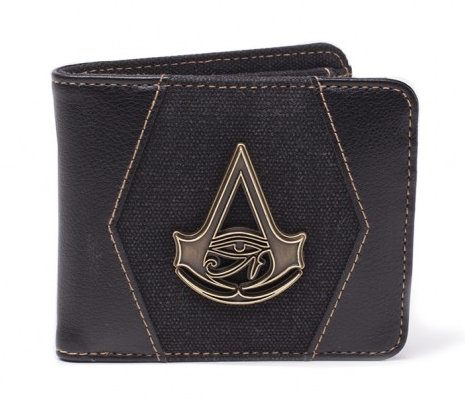 Product Reveal: Assassin's Creed Origins Chain Wallet. Assassin's Creed Origins Wireless Headphones. 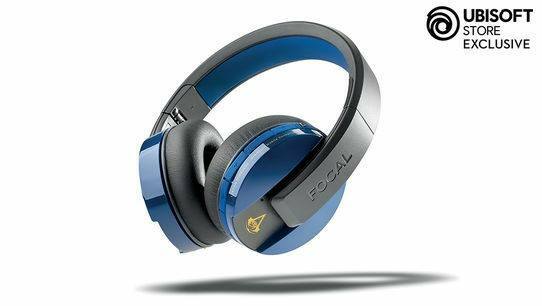 Assassin’s Creed Origins Utopia Headphones by Tournaire. A 3d artist, an art caster and a goldsmith worked together with the jeweler for several months in order to create this piece of art which features yellow gold design elements. This piece of art will include 18-karat gold elements. Price: €50,000 / £44,000 / $59,000. Bronze Bayek Bust by Tournaire. "Our latest hero of the Assassin’s Creed universe, Bayek is the hero of Assassin’s Creed Origins. While his history has yet to be revealed (we don’t want to spoil the game! ), Bayek will undoubtedly become a fan favorite Assassin and a beautiful addition to the 2nd series of the Assassin’s Creed Red Lineage collection. All copies of this 10x13 print are hand signed and limited to 300 units (all numbered). This rare piece of art is a true collector’s gem that will complete your Assassin’s Creed collection either by itself as alongside the rest of the Assassin’s Creed Red Lineage showcase." An Assassin needs a variety of tools and supplies and our Assassin’s Creed Origins - Canvas Backpack answers that call! Subtly showcasing the Assassin’s Creed Origin logo as a brass buckle, this backpack is made from canvas making it rugged and tough to handle any mission. With ample storage space and beautiful interior lining, this bag will serve you well for any mission. ​Another piece from the Assassin’s Creed Origins jewelry collection! The Assassin's Creed Origins - Bayek Bracelet was designed after the amulet worn by Bayek. Engineered to wrap around the wrist 4 times, this bracelet sports Bayek’s eagle amulet and will certainly show your fandom for the game! You can also wear your Assassin's Creed Origins - Bayek Bracelet as a necklace thanks to the long leather string. Assassin's Creed Origins: Bayek's Shield Belt. ​Our Assassin's Creed Origins - Bayek Shield Belt is a great accessory to your wardrobe. Designed after Bayek’s shield in game, this belt features an ancient Egyptian emblem with the famous Assassin’s Creed logo. A solid addition to your Assassin’s Creed collection, this belt is exactly what is needed when gearing up to take on the Templars. Assassin's Creed Origins - Bayek Inspired Zip Around Bi-Fold Wallet. 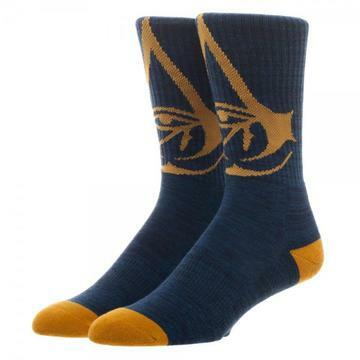 Assassin's Creed Origins socks by Bioworld. Product Reveal: Assassin's Creed Origins Lanyard.